The Aqua Rite Low Salt Electronic Chlorine Generator from Hayward offers the same simple, safe and affordable approach to pool sanitization that you would expect from the original Aqua Rite, but uses virtually half the amount of salt, making it an even more environmentally friendly approach to salt chlorine generation. They easily install on standard filtration system, both for new construction and on existing pools. Forget about mixing, measuring or messing around with harsh liquid or tablet chlorine. Say goodbye to red eyes, itchy skin, heavy chemical odors and the bleaching of toys and clothes. Now there’s an easier, more efficient and cost-effective way to satisfy 100% of your sanitization needs and enjoy pool water that’s always clean, clear and luxuriously soft. Aqua Rite Low Salt uses advanced electrolytic technology to convert a small amount of ordinary salt – one teaspoon per gallon of pool water – into a virtually endless supply of fresh, pure chlorine. The process can produce enough chlorine a day to satisfy the sanitization requirements of pools up to 25,000 gallons. And since the salt doesn’t wear out or evaporate, you rarely have to add more. There are two components to AquaRite Low Salt: the control box and its patented TurboCell®, a specially designed electrolytic converter that installs on your system’s return line, behind the pump, filter and heater. As pool water passes through the TurboCell, an extremely safe electrical charge generated by the control box automatically converts the dissolved salt into fresh, pure chlorine. The water is then dispersed evenly throughout the pool by the return jets. Each time the water is recirculated, the salt-based chlorine gets recharged and the cycle is repeated. Salt is present in multiple locations such as in tap water and in pools treated with stabilized liquid or chlorine. 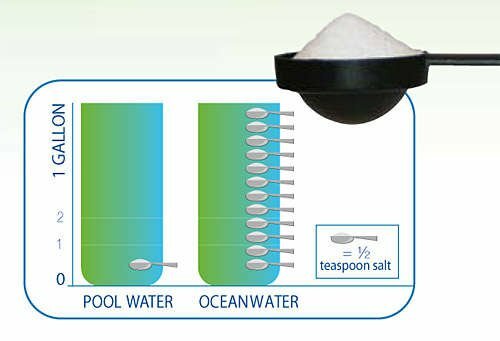 Over time, conventionally treated pools will have an elevated residual of salt as a by-product of sanitizing. The AquaRite Low Salt chlorinator has the ability to stop producing chlorine at 800 p.p.m. and operates at just 1200 - 1800 p.p.m., lower salt levels reduce corrosion concerns and is safer for the environment. The Aqua Rite Low Salt Chlorine Generator from Hayward offers the same simple, safe and affordable approach to pool sanitization that you would expect from the original Aqua Rite, but uses virtually half the amount of salt, making it an even more environmentally friendly approach to salt chlorine generation. They easily install on standard filtration systems, both for new construction and on existing pools. Salt (NaCl) is present in tap water and in pools treated with stabilized liquid or chlorine pucks. Over time, conventionally treated pools will have an elevated residual of salt as a by-product of sanitizing. The Aqua Rite Low Salt chlorinator has the ability to stop producing chlorine at 800 p.p.m. and operates at just 1200 - 1800 p.p.m. (this is roughly half the amount of the standard Aqua Rite.) The benefits of lower salt levels include a reduction/elimination of electrolytic corrosion, a reduced environmental impact as well as reduced operation costs with less salt addition. Installing the Aqua Rite Low Salt does not change from a typical installation, however it is a good idea to ensure the water is tested for salt prior to adding salt. In many cases when installed on an existing pool previously sanitized by liquid or pucks - NO salt will be needed. Aqua Rite® Low Salt uses advanced electrolytic technology to convert a small amount of ordinary salt – one teaspoon per gallon of pool water – into a virtually endless supply of fresh, pure chlorine. The process can produce enough chlorine a day to satisfy the sanitization requirements of pools up to a size of 18 x 36. And since the salt doesn’t wear out or evaporate, you rarely have to add more. There are two components to Aqua Rite Low Salt: the control box and its patented Turbo Cell®, a specially designed electrolytic converter that installs on your system’s return line, behind the pump, filter and heater. As pool water passes through the Turbo Cell, an extremely safe electrical charge generated by the control box automatically converts the dissolved salt into fresh, pure chlorine. The water is then dispersed evenly throughout the pool by the return jets. Each time the water is recirculated, the salt-based chlorine gets recharged and the cycle is repeated. The Standards Council of Canada (SCC) has granted UL - Canadian Certification Organization (CO) and Testing Organization (TO) status, which accredits UL to conduct tests and issue certifications to Canadian National Standards. This Product is PMRA APPROVED - The Health Canada Pest Management Regulatory Agency (PMRA) is responsible for pesticide regulation in Canada. Created in 1995, this branch of Health Canada consolidates the resources and responsibilities for pest management regulation. Buying this product from Discounter's Pool & Spa Warehouse means you are buying a Canadian Certified and Regulated product, Hayward Canada only Warrants products that are purchased in Canada and do this by tracking Serial Numbers. If you are to purchase from across the border you will not have a valid manufactures warranty and will not have a Certified / Regulated Canadian Product.